Many students now struggle with their writing assignments and find an option of buying essays online pretty attractive. However, before placing an order, it is useful to get some trustworthy information about this or that writing company in order to ensure that the quality of a paper will be satisfying, and the whole cooperation will not be a scam. 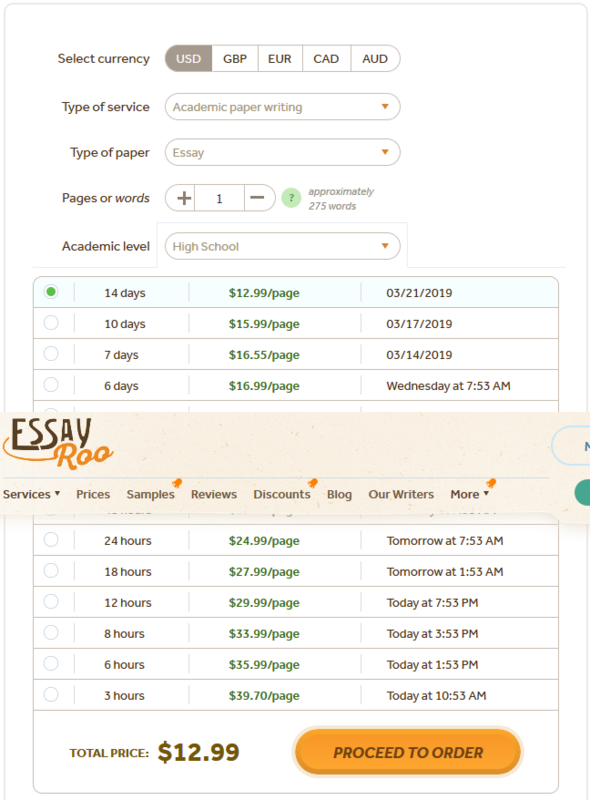 EssayRoo.com specializes in academic writing assistance for students. 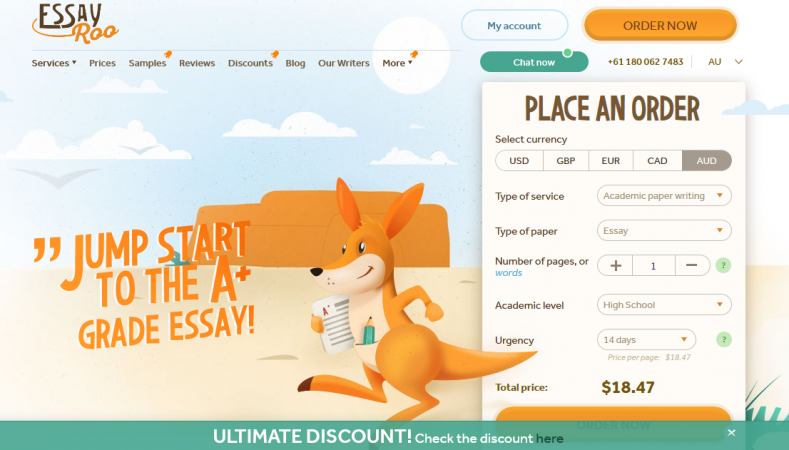 It is an Australian writing service but it works with international students as well. There are some sample essays presented on the website. It does not mean that your essay will look the same. The best way to check everything is to place the order. We ordered an essay with some specifications and limited timeframe. The order was delivered on time, however, its quality was not high enough to meet our expectations. First of all, EssayRoo.com guarantees 100% uniqueness of a delivered paper. After checking it, it can be stated that the essay is not customized and written from scratch. In addition, some requirements we specified were not taken into account while writing. So, some useful information was missed. There were no problems with placing an order. The only thing is that it is indicated on the website about getting a confirmation letter concerning the order. These letters are sent very seldom. So, there is a necessity to ask for help using a customer support platform. In order to speak to a customer support representative, you have to fill in your name, your e-mail address, and a department you need. It takes some time, taking into account that managers do not typically reply after 1 minute. Customers have to wait up to 15 minutes to have a conversation with an agent. The contact information of a company is presented on the website, including phone numbers and e-mail address. It is said that after placing an order, there is an opportunity to get free notifications concerning the writing process. Sounds great but it does not work. In order to get some information about your assignment, you have to contact the agents by yourself. The notification system seems to be a failure. The design of a company`s webpage plays an important role as well. Speaking about EssayRoo.com, the page is full of different tables and infographics. Sometimes it is hard to find what you need. You can find a review section there. There are not so many of them. it shows the level of experience. Note that each customer can leave a testimonial there. You do not need to have an account with a confirmation of paper order for it. So, not all reviews are surely trustworthy. Prices mainly depend on the deadline, academic level of a paper that needs to be done, and the number of pages. Comparatively, prices are a bit higher. They do not actually meet the quality of papers. There are many other online companies offering lower prices for the same services. The company guarantees no hidden charges but after getting a bill to pay, some questions arise. Your own calculating can be different from the price you actually have to pay for the order. 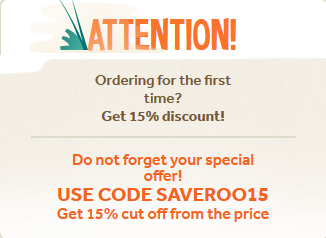 All new customers can place their first order with a 15% discount. However, this offer does not always work for all. To sum everything up, it is better to think twice before taking up writing services at EssayRoo.com. The highest quality and the most effective cooperation are not guaranteed, though. There are some aspects this company should take into account to make their work more productive and satisfying.